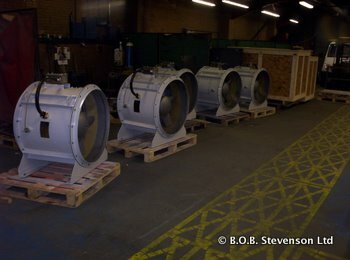 We manufacture directly driven in line axial flow fans which are suitable for medium to high volume & low pressure applications. 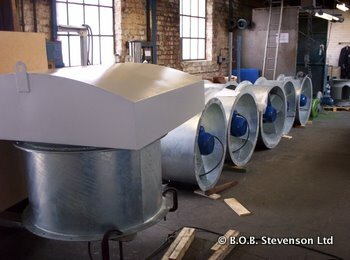 Our Turngrove axial fans are intended for building services and general ventilation applications and are offered with case construction from mild steel painted or galvanised after fabrication or stainless steel bead blasted after fabrication. To standard motor types we can fit aerofoil section polypropylene, polyamide or adjustable pitch aluminium impellers or we can fabricate mild steel or stainless impellers to fulfil certain performance attributes. Turngrove axial fans come with metric cases and flange drillings to suit common duct dimensions of 300, 315, 400, 500, 560, 630, 710, 800, 900 & 1000mm diameter. Our Flamgard axial fan range is available in imperial case dimensions of 18,21,24,32,48,60 & 72” diameter with flanges drilled to suit. 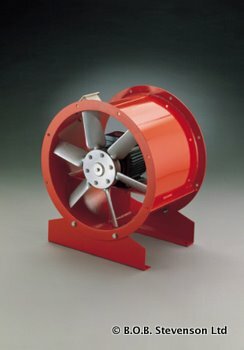 Flamgard axial fan cases and impellers are generally fabricated from thicker section stainless steel in 316L or 304 grades and are intended for operation in arduous conditions and may include brass anti-spark protection. Higher specification driving motors such as Exde may be fitted with appropriate glands and conduit used to extend motor & sensor connections to an external terminal box on the fan casing. 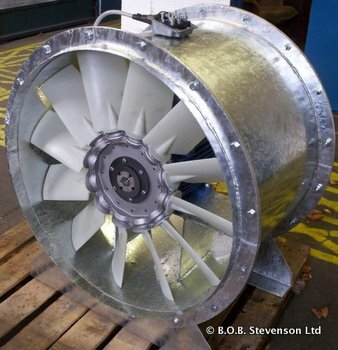 All axial fans are available with a range of ancillaries such as flexible connections, backing flanges, spigot flanges, fan feet, Anti vibration mounts, vibration monitoring, rotational sensors.